CHAMPAIGN, Ill. - New observations could improve industrial production of high-quality graphene, hastening the era of graphene-based consumer electronics, thanks to University of Illinois engineers. 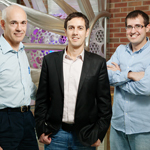 Professors Joseph Lyding, left; and Eric Pop, center; and graduate student Josh Wood identified copper crystal structures that work best for growing high-quality graphene. "Graphene is a very important material," Lyding said. "The future of electronics may depend on it. The quality of its production is one of the key unsolved problems in nanotechnology. This is a step in the direction of solving that problem." "It's a very cost-effective, straightforward way to make graphene on a large scale," said Joshua Wood, a graduate student and the lead author of the paper. "However, this does not take into consideration the subtleties of growing graphene," he said. "Understanding these subtleties is important for making high-quality, high-performance electronics." While graphene grown on copper tends to be better than graphene grown on other substrates, it remains riddled with defects and multi-layer sections, precluding high-performance applications. 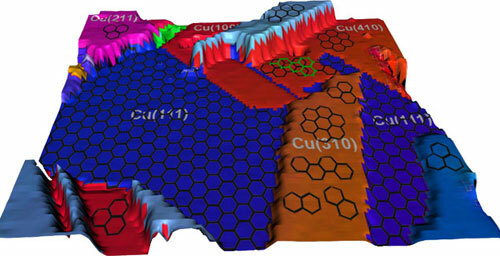 Researchers have speculated that the roughness of the copper surface may affect graphene growth, but the Illinois group found that the copper's crystal structure is more important. "In the (100) configuration the carbon atoms are more likely to stick in the holes in the copper on the atomic level, and then they stack vertically rather than diffusing out and growing laterally," Wood said. "The (111) surface is hexagonal, and graphene is also hexagonal. It's not to say there's a perfect match, but that there's a preferred match between the surfaces." The U. of I. team speculates that it may be possible to improve copper foil manufacturing so that it has a higher percentage of (111) crystals. Graphene grown on such foil would not be ideal, but may be "good enough" for most applications. "The question is, how do you optimize it while still maintaining cost effectiveness for technological applications?" said Pop, a co-author of the paper. "As a community, we're still writing the cookbook for graphene. We're constantly refining our techniques, trying out new recipes. As with any technology in its infancy, we are still exploring what works and what doesn't." "There's a lot of confusion in the graphene business right now," Lyding said. "The fact that there is a clear observational difference between these different growth indices helps steer the research and will probably lead to more quantitative experiments as well as better modeling. This paper is funneling things in that direction." Editor's note: To contact Joe Lyding, call 217-333-8370; email: lyding@illinois.edu. To contact Eric Pop, call 217-244-2070; email: epop@illinois.edu. The paper, “Effects of Polycrystalline Cu Substrate on Graphene Growth by Chemical Vapor Deposition,” is available online.